The puppy years are the most important life stage for dogs of all breeds and sizes. During those first couple years of life, puppies experience dramatic growth spurts. Their bones, organs, and muscles are all developing at a rapid rate to help your dog thrive as an adult. This is especially true for larger breeds. Big dogs have longer developmental cycles than smaller breeds. It can last upwards of two years. Furthermore, bigger canines gain a significant amount of weight in that short amount of time. Needless to say, large breed puppies have special care requirements that you need to stay on top of. One of the biggest factors of their developmental cycle is their nutritional intake. Young pups need plenty of fuel to reach their adult size. While the task may seem easy enough, there's a lot to consider when you're planning your pup's diet. Young dogs are sensitive to the effects of nutritional imbalances. You'll need to invest in a high-quality dog food that's specifically designed to meet the needs of growing large breed puppies. Here are a few great options to get you started. 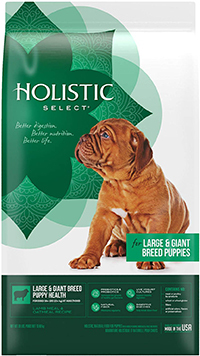 This kibble from Holistic Select is designed for puppies that will weigh 50 pounds or more as an adult. It can provide your pooch with a balanced diet while supporting their digestive health. Plenty of probiotics, prebiotics, fiber, and digestive enzymes are included. About 25% of the recipe is made up of protein for proper muscle development. Lamb meal and chicken meal are used as the main source. There are no meat byproducts, artificial colors, flavors, or fillers. Instead, it contains natural ingredients that can benefit your puppy's health. These include salmon oil for omega fatty acids, cranberries for antioxidants, and much more. It also meets the nutritional levels established by the AAFCO. 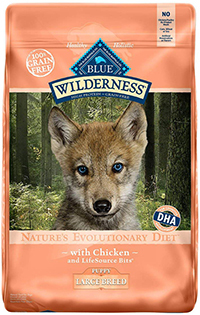 The large puppy formula from Blue Buffalo is designed to imitate the diet of wild canines. It's packed with protein and uses deboned chicken as the main source. To complement the chicken, fish meal and eggs are also added. L-Carnitine, a natural amino acid, is also thrown into the mix to ensure that your puppy develops lean muscle mass. One unique feature of this kibble is that it contains the company's LifeSource Bits. These tiny morsels are chock-full of antioxidants, vitamins, and minerals to support your dog's overall health. 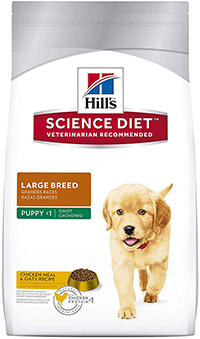 The large puppy formula from Hill's Science can provide a number of benefits to your canine companion. It's balanced and nutritious for proper development during the puppy years. However, it's also designed to avoid excessive weight gain and prevent skeletal issues in the future. It has optimal levels of calcium, glucosamine, and chondroitin to support the bones and joints. There's also a blend of antioxidants and vitamins to enhance their immune system. Chicken meal is used as the main ingredient and contributes to the 27% protein content. Overall, the kibble is simple. There are no artificial colors or preservatives. The natural ingredients used are healthy and easy to digest. 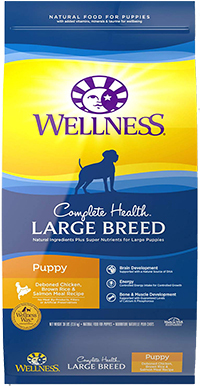 If you're looking for an all-natural dry dog food that's made in the USA, take a look at this product from Wellness. It contains high-quality ingredients throughout. Protein makes up approximately 29% of the formula thanks to the deboned chicken, chicken meal, and salmon meal. This extra boost of protein can help your dog develop the strong muscles they need to thrive. Additional ingredients like peas, oatmeal, apples, and sweet potatoes add some healthy vitamins and minerals. The food also has ground flaxseed and fish oil to keep your dog's skin healthy. To help avoid joint issues in the future, a safe amount of calcium is added. 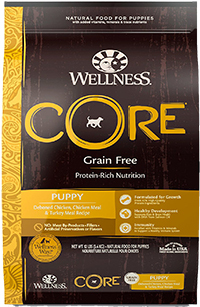 With about 35% protein, this dog food from Wellness Core is a great choice for developing puppies. That protein comes from deboned chicken, chicken meal, and turkey meal. It also has safe levels of calcium for safety and meets the guidelines set by the AAFCO. There are no artificial additives or grains in the recipe. Instead, you'll find wholesome ingredients like carrots, spinach, blueberries, kale, and more. The addition of numerous plant-based ingredients creates a complex vitamin profile that can benefit your pup's health as they develop. Probiotics, prebiotics, and fiber are also added to keep your pup's digestive tract in check. Why Do Puppies Need a Special Formula? It's a common misconception that puppies don't need a lot of food because of their small size. When compared to their body weight, puppies require more calories than an adult dog. Not only that, but they must also be fed more frequently. Many new dog owners are surprised by how much food their growing pup will consume each day. They need all of this fuel to develop properly. Their bodies will attempt to grow regardless of whether or not they're getting the nutrition they need. Failing to supply them with a nutrient-rich diet can result in stunted growth, malnutrition, and a host of health issues in the future. Large dogs are susceptible to many unique ailments. Unfortunately, the manner in which they grow can have an effect on what types of health problems they experience and how severe it is. You can help your canine companion avoid problems by making sure that they're getting all the nutritious food they need. There is a wide range of formulas on the market, so you're going to have to do a bit of extra work to find the right one for your dog. Not all recipes are made the same. Stick to products that are made for large breed puppies and take a look at the ingredients list to make sure that it fits the criteria. Your puppies diet should consist of at least 25% protein. However, a higher percentage is always welcome. Proteins are the building blocks of muscles. A whole protein source should be at the top of the ingredients list. Look out for high-quality sources like chicken, beef, or fish. Sources like chicken meal are also acceptable as long as the animal is listed. One thing you'll want to avoid is unidentified meats. These include byproducts of mystery meat meals. If the specific animal from which the protein comes from isn't listed, move on to the next choice. These sources can come from questionable sources and don't contain as much muscle-building amino acids as wholesome sources. A colorful selection of fruits and vegetables is great for dogs. Leafy greens and other plant-based ingredients add a healthy dose of vitamins and minerals. Some of the best kibble recipes contain ingredients that are filled with antioxidants. These include blueberries, cranberries, spinach, and more. Antioxidants help to support the immune system so that your puppy is able to fight off diseases. Omega fatty acids are healthy fats that add loads of flavor while supporting many bodily functions. They can support the brain, improve overall cardiovascular health, and ensure that your pup's coat remains supple. Many manufacturers include omega fatty acid with fish oil or flaxseed oil. Probiotics can help your dog's intestinal tract function properly. The beneficial bacteria can ensure proper absorption of nutrients and help break down food. They can be added to your dog's diet with supplements. However, many puppy formulas contain probiotics in the recipe as well. One way to make sure that a dog food is healthy for your large breed puppy is to look out for information from the Association of American Feed Controls Official, or AAFCO. Scan the label and check to see if the products meet the nutritional guidelines set by the AAFCO for the growth of large size dogs. When Should A Dog Switch To Adult Food? Puppies should be supplied with a puppy-specific formula after they're properly weaned off their mother's milk. When to make the switch to standard food for adult dogs depends entirely on your pup's specific breed. Typically, it'll be whenever your dog reaches full adult status. Large dogs like German Shepherds reach adulthood between 12 and 18 months. 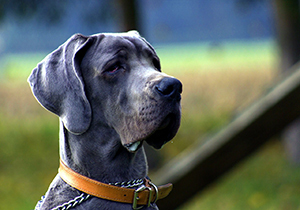 However, giant breeds like Great Danes aren't adults until about two years. It's important that you consult with your veterinarian for specific information about your dog's development cycle. Making the switch too early can be damaging to their health as well. You'll need to figure out when it's healthy to change their diet. It's better to feed them puppy food for a bit longer rather than changing too early. As mentioned earlier, larger dog breeds are at risk for many health issues. These ailments can be affected by their diet at an early age and persist throughout their lives. It's a good idea to familiarize yourself with these problems so that you can be proactive about your dog's health in the future. A lack of proper nutrition can lead to a developmental disease at a young age. These conditions affect dogs when as they're reaching adulthood and are prevalent among larger breeds. It can cause immense pain in their legs and joints. Depending on the severity of the problem, it can cause lameness in the legs and make it difficult for a dog to walk at all. Usually, problems like these happen because the dog goes through the rapid growth phase without adequate fuel. The bones, joints, and muscles can develop at different rates, causing deformity. By providing a high-quality puppy kibble, you can avoid this problem. One of the most common issues that large dogs face is hip dysplasia. This starts to develop in the puppy years. However, it may not make itself known until the dog gets older. With this condition, the hip socket is malformed. It can cause pain and lameness. A similar issue can also develop in a dog's elbows. There are many causes of hip dysplasia. While genetics do play a part, the condition can be exacerbated with a poor diet. Accelerated growth due to overfeeding is a known cause. Puppies grow fast enough as it is. If you give your dog a never-ending supply of kibble, they'll gain weight faster than their bodies can keep up. Obesity will worsen the issue. To avoid overfeeding, separate your puppies dietary requirements into premeasured meals. 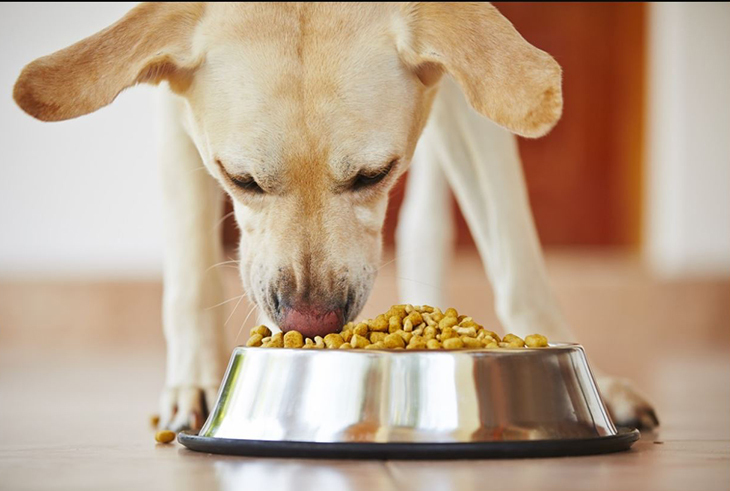 Avoid free-feeding so that you have greater control of what your dog is consuming. Another cause is too much calcium. Calcium is a necessary nutrient that's responsible for bone health and development. However, too much of it can lead to skeletal issues like hip dysplasia. There's a fine line between not giving your pup enough calcium and providing them with too much. The AAFCO has determined that large breed puppies need to have a formula that contains between 1.2% and 1.8% calcium. Gastric Dilatation and Volvulus, commonly referred to as bloat, is a life-threatening issue that can affect large dogs of all ages. It happens when dogs eat too much food in a short period of time. The stomach can twist and trap gas inside. You can avoid bloating by splitting up their meals into smaller portions, providing larger kibble that requires chewing, and making your pup wait for 30 minutes after a meal to exercise. You can set your puppy up for success by taking the time to select the right kibble that meets their unique dietary needs. With a high-quality food, you'll be able to watch your rambunctious large breed puppy develop into a strong and active dog right before your eyes.